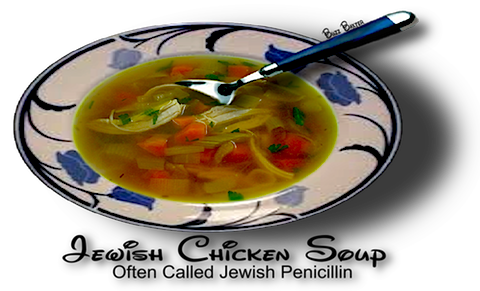 Jewish Penicillin!. We are talking "Folk Medicine" here folks. ✸ Rather than discarding the fat,  You can render the fat into Rendered Chicken Fat, "Schmaltz". for the next time you want to make chicken soup. ●  2 large carrots, cut into three or four pieces each. ●  1 large parsnip, cut into three or four pieces. ●  1 onion (whole) You can use two onions if you really like onions. One onion is probably enough though. forming, add the carrots, onions, and herb bundle. Cover and boil for one and a half hours. 2. When cool, using a fork,  or squeeze with a tight fist and press the liquid from the herb bundle and add it to the soup. large bowl and refrigerate overnight so that the fat will harden. 4. Next day: Remove the fat that has formed on the top of the soup and set aside to render the fat into  “Schmaltz” Recipe. 5. Heat the soup and add, if you desire,   Matzoh balls or pre-cooked noodles to the soup before re-heating and serving. 6. Extra soup can be frozen, if desired.